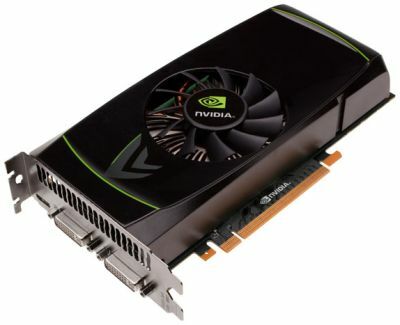 It’s done, NVIDIA has released a new GeForce: the GeForce GTX 460. The GTX 460 is based on the new GF104 GPU which is an architecture slightly different from the GF100. In the GF100 arch, each SM (or Streaming Multiprocessor) is made up of 32 SP (or Shader Processor). In the GF104, there are 48 SP per SM. The GF104 has 8 SMs which gives a total of 384 SP. 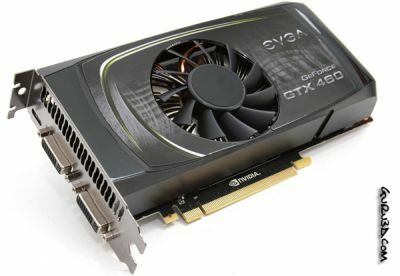 But the GTX 460 comes with only 336 SP because NVIDIA has disabled one SM. 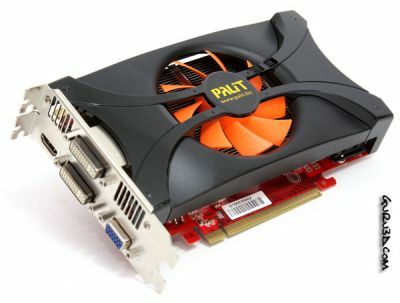 There are two versions of the GTX 460: one with 1024MB of GDDR5 memory and the second with 768MB of GDDR5 memory. 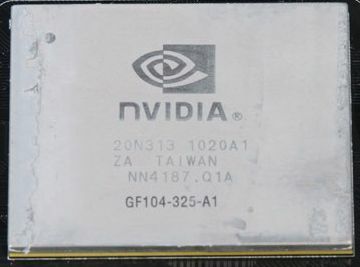 The 1024MB comes with a memory bus width of 256 bits whereas the 768MB features a 192-bit bus width (the GTX 465 has a 256-bit bus width and the GTX 480 has a 384-bit bus width). Shader processors: 336 @ 1350MHz (twice the core clock speed). Memory: 768MB (192-bit) or 1024MB (256-bit) GDDR5 @ 900MHz (real speed) or 1800MHz (DDR speed) or 3600MHz (QDR speed). More information about graphics memory speed HERE. 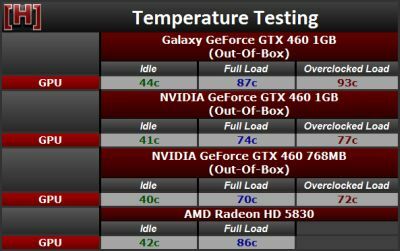 According to Guru3D, the GPU temperature varies from 56°C (EVGA GTX 460 768) to 74°C (Palit GTX 460) when stressed with FurMark. 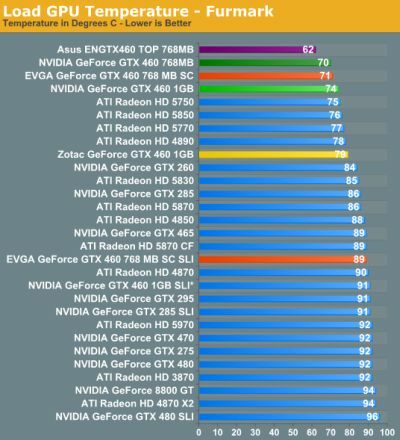 AnandTech has also temperatures and power consumption when the cards are overclocked HERE. I think the only way to come across from this launch at all disappointed is when looking at the overall performance levels of the card. 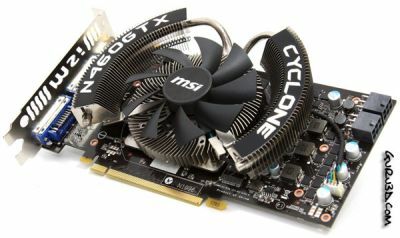 The GTX 460 does not completely subdue last year’s $200 cards, and this is part of a larger pattern. DX11 functionality requires additional die space over DX10 functionality, so most of the additional transistors afforded by the transition to 40nm fabrication has been spent on that functionality rather than on improving performance. 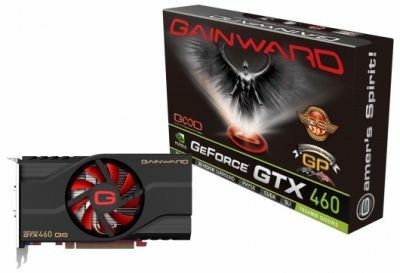 As a result this year’s $200 cards aren’t a great deal faster than last year’s cards; this isn’t the high-end market where GPU dies (and prices) had room to grow. For everything but the high-end, this year is a feature year and not a performance year. NVIDIA’s new GF104 GPU might just be the savior the company was looking for as it is delivering in all the areas that are required for a successful mainstream graphics product. 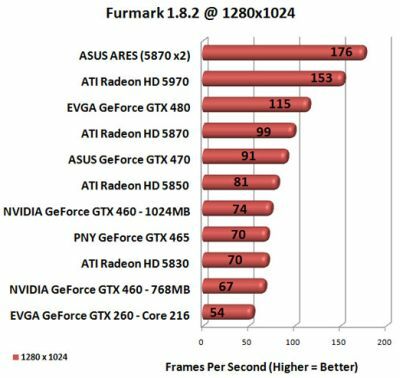 The GeForce GTX 460 is faster than the Radeon HD 5830, costs about the same, is just as power efficient and has room for overclocking. If you are looking for a new graphics card in the $200 budget, NVIDIA looks to have the best solution available! 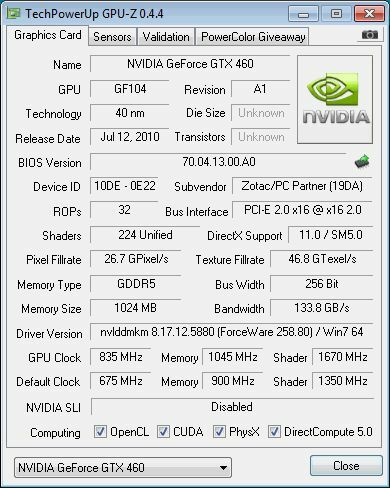 NVIDIA’s new GeForce GTX 460 is Fermi done right. Whereas the GF100 based products were plagued by excessive power consumption resulting in high temperatures and noise levels, the GTX 460 delivers massive improvements here. 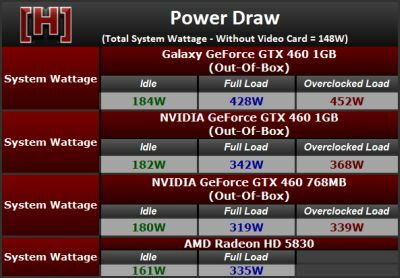 Essentially NVIDIA managed to reduce idle power consumption below ATI’s HD 5000 levels, and gaming power consumption to slightly higher but similar levels. This improvement in power consumption trickles down to temperatures and cooler noise helping NVIDIA’s new card to be able to compete there. At roughly 200 USD/EUR you can expect to get what you pay for, a silent product that will play your games up-to 1600×1200, and in most cases 1920×1200 quite well. What surprised us was the tremendous overclocking potential, pretty much any and every card we tested today has shown a lot of reserve and room for overclocking, and they scale really well while doing so. Any card, even the cheapest you can find, can be pushed to 800 MHz on the core, period. Two energy connectors? No thx! A fan and a heatsink? No thx! Ati fan boys? No tnx! The best card Nvidia has made in the last two years. A big thumbs up and that comes from an Nvidia hater. I am actually going to get one for my secondary PC. WHT, what’s wrong with two power connectors? This is a gaming card people. At least not an epic failure this time. A solid card just 6 months too late! They even upped the count of TMUs. Seems to be a perfect mid-range card (finally). 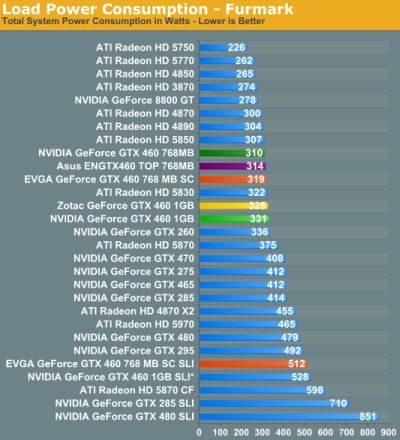 ….might as well buy a two 5770 Vapor-x for performance and looks!! ..dual supply means dual power consumption for a single card? gnahhh..